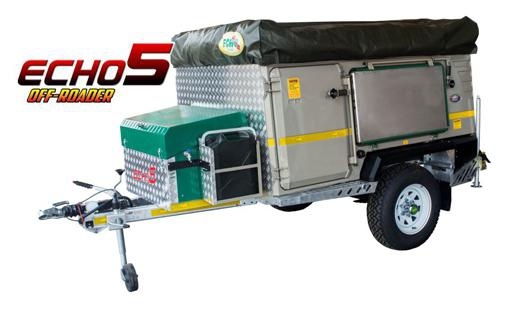 The Echo 5 Off-road trailer is constructed of superior materials therefore it is lightweight yet robust while maintaining the ability to handle the most severe conditions. This military inspired trailer has earned the title of one of the most durable high performance off road products. The kitchen design provides a large working surface with a standalone stainless steel table, two plate gas stove, a cupboard for crockery and cutlery and a wash basin with drying rack. In addition it has been designed to accommodate up to two fridge units one in the nose cone and one sliding outwards for ease of access. Further more the spacious design offers flexible sleeping options. It can easily accommodate a large family with comfort. The Echo 5 can be manufactured with either leaf spring suspension with floating rear shackles or as fully independent coil suspension. It is not often that you get so many features together with style that puts it a cut above the rest.